After being kidnapped and imprisoned for fifteen years, Oh Dae-Su (Min-sik Choi) is mysteriously released, only to find that he has just five days to find his abductor. Call it healthy curiosity or rampant procrastination, I often get drawn in by film lists. You know the ones - how many of these 100 movies have you seen etc. Well, I was interested to note that I had watched 96 of the 100 films in Empire magazine’s 100 Greatest Movies issue (July 2017). One of the four glaring omissions was Oldboy. Released in 2004, I had been meaning to see Park Chan-wook’s classic revenge thriller for years. As I finally sat down to watch I thought it odd, given the film’s status and reputation (and a 2013 American remake by Spike Lee), that I knew very little about its story. This undoubtedly enriched my experience of Oldboy... for if you dare to travel to the heart of the heart of darkness, the less you know the better. Two hours later and I found myself stunned, almost unable to move. What had I just watched? Had that all really happened? 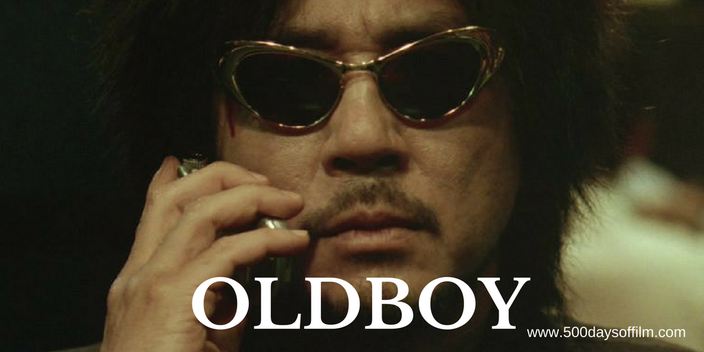 In those initial moments, all I knew was that Oldboy is a visually stunning, cinematic masterpiece. I knew that its story had held me in a claustrophobic grip through every one of those 120 minutes. And I knew my teeth wouldn’t feel the same for a long, long while. Not to mention my appetite for sushi. I am no expert in Korean movies but I love what I have seen. This country has a number of brave and committed filmmakers - each with impressive stamina, ready to push the very limits of cinema. Whether during its moments of extreme, graphic violence or during its almost unbearable scenes of paranoia-fueled tension, Oldboy is a dark and twisted gem in the revenge thriller genre. What makes Oldboy such an incredible film experience is its impressive style, black comedy and (horribly) compelling performances. Min-sik Choi is superb as Oh Dae-Su - his captivity is nightmarish (we feel his unspoken pain in every torturous expression) and yet, particularly in his relationship with television, oddly fascinating. Once released, we go on a journey with Dae-Su to uncover the reason for his abduction and to seek vengeance on his kidnapper. However, this investigation sends him further and further down the rabbit hole of his past - until a horrific final reveal that is not for the faint-hearted. If you have, what do you think of Park Chan-wook’s revenge thriller. Let me know in the comments section below or via Twitter or Facebook.